Network restructuring continues at Frontier Airlines as the ULCC attempts to carve out its place among ultra low-cost airlines within the consolidated US market place. Frontier appears to be straddling a model of small city service while expanding into larger markets where it deems fares are high and it believes stimulation opportunities exist. Among the changes undertaken by Frontier is a return to Philadelphia, which is geographically close to its focus city of Trenton, New Jersey. Frontier is making some changes in Trenton that appear to reflect seasonal shifts. Its decision to resume service to Philadelphia obviously raises questions about Trenton’s future in Frontier’s network and the evolution of its route strategy. But the airline seems committed in some fashion to the smaller airport in the near term. The latest round of adjustments also show Frontier upping its overlap with the large US majors, and, in some cases, fellow ULCC Spirit. As Frontier unfolds its network strategy under new ownership, the theory that the US can support more than one large ultra low-cost airline will continue to be put to the test. During the past couple of years that culminated in the purchase of Frontier by Indigo Partners, previously a major investor in ULCC Spirit Airlines (and others globally), Frontier’s network has undergone waves of changes. It had a short lived focus city stint in Colorado Springs, transformed Trenton into a focus city and established point-to-point service from Wilmington, Delaware. After the sale of Frontier to Indigo was complete, the airline added service from Chicago O’Hare, Washington Dulles and made a rapid build-up in Cleveland after United inevitably initiated a major pull-down of its smallest hub. Frontier also added numerous markets from Cincinnati, a hub that has endured service cutbacks by Delta Air Lines. The airline has made some adjustments to its route pairings from Cleveland and Washington Dulles, including cutting service between those two destinations and eliminating flights from Cleveland to New York LaGuardia and Trenton. It is opting to use the Cleveland-LaGuardia slot pair for new service from LaGuardia to Miami, a route operated by American and Delta Air Lines. In addition to the Miami-LaGuardia route, Frontier has also added service from Washington Dulles, Philadelphia, Chicago O’Hare and Denver to Miami. It also serves nearby Fort Lauderdale (34km from Miami) with flights to Trenton, Washington Dulles, Cleveland and Cincinnati. It is an interesting bifurcation for Frontier, whose ultra low-cost mantra would seemingly dictate that serving two airports so close together would be cost prohibitive, especially given Miami’s higher operating costs versus Fort Lauderdale. Frontier also has a similar pattern elsewhere in its network, serving both Washington National and Washington Dulles. Frontier opts to return to Philadelphia – when do the larger airlines respond? A vital part of the near term future of ULCCs in the US is how the powerful and cashed-up majors decide to respond to intrusions by their smaller peers. There is undoubtedly a market for lower prices, especially at airports which have lost large connecting traffic flows. But with a flick of their tails, the big three - or four - can make life difficult for the new entrants. Frontier in late 2014 returned to US Airways’ stronghold of Philadelphia after ending service at the airport to focus on the build up of Trenton, which is 58km from Philadelphia and 72km from United’s hub in Newark. The airline’s strategy in Trenton was to target customers with lower fares that did not want to travel to either hub airport. At one point Frontier operated service from Trenton to nearly 20 destinations, but has eliminated service to Nashville, St Louis, Indianapolis, Milwaukee and Cleveland. News outlet NJ.com has reported that Frontier will resume seasonal service to Detroit and Minneapolis in Apr-2015, and has increased flights to Tampa, Orlando and Fort Myers, Florida in the winter time period. Schedules in CAPA and OAG for the week of 12-Jan-2015 to 18-Jan-2015 show that Frontier presently operates service from Trenton to Atlanta, Charlotte, Chicago Midway, Fort Lauderdale, Fort Myers, Orlando, Palm Beach, Raleigh-Durham and Tampa. In late 2014 Frontier launches service from Philadelphia to Cancun (a market it also operates for Apple Vacations), Miami, Orlando, Punta Cana and Tampa. In Mar-2015 it is adding service to three legacy airline hubs – Atlanta, Charlotte and Chicago O’Hare. It serves all three of those markets (Chicago through Chicago Midway) from its Trenton base. By the time it launches all the planned new routes from Philadelphia, Frontier will serve six of the airport’s top 10 domestic markets measures by seats. The duplication seems to counter ULCC conventional wisdom; but airline executives told news outlet The Philadelphia Inquirer in late 2014 that it has no plans to change its Trenton strategy. Frontier's return to Philadelphia is based on the premise that it is launching flights to under-served markets with high fares. But all the markets it will operate from Philadelphia have ample service. Only two markets – Cancun and Charlotte – have one other competitor, Philadelphia’s largest airline US Airways (which holds a 75% share at the airport). Both US Airways and Southwest operate flights from Philadelphia to Tampa, Orlando and Atlanta (alongside Delta). 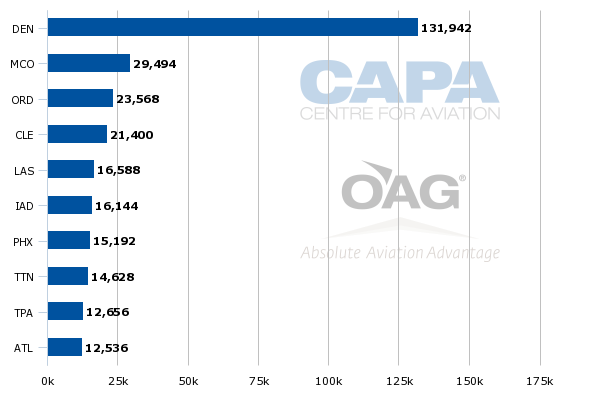 Chicago O’Hare has the largest competitive overlap. US Airways, United, American and Spirit all offer service to the airport from Philadelphia. Key to Frontier’s success on those routes is an ability to stimulate traffic with lower fares, which presumably are underpinned by low costs. President Barry Biffle told the Philadelphia Inquirer that Frontier's costs are 30% to 40% lower than those at American, “so you would expect to see our fares that much lower”. Mr Biffle was an executive at Spirit when the airline seized on an opportunity to inject lower fares in south Florida by capitalising on Fort Lauderdale’s lower costs to stimulate traffic. American dominated and remains the largest airline in Miami. During Mr Biffle’s time at Spirit the airline also made huge inroads into Dallas/Forth Worth, concluding stimulation opportunities were ripe due to American’s dominance at that airport. Mr Biffle’s former employer Spirit already provides an ULCC presence at Philadelphia with service to Dallas/Fort Worth and Las Vegas, but it is not a huge market for the airline. The joint US Airways-American (the two airlines are in throes of merger integration) response to Frontier’s Philadelphia expansion should be closely watched. 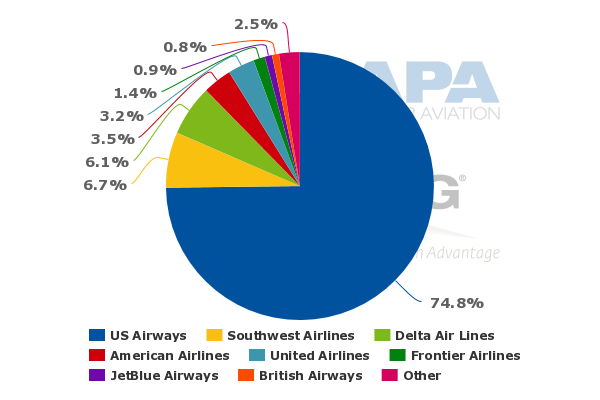 American’s upper management is primarily dominated by former US Airways executives that have stated they pay close attention to Spirit’s movements (Spirit is DFW’s second largest airline measured by seats with a 4% share for the week of 12-Jan-2015 to 18-Jan-2015). Delta has also responded to Spirit’s expansion by creating new fare classes with a bare bones option to compete with Spirit’s low base fares. Spirit, which constantly touts its low fares, also recently cited pricing pressure for close in bookings as it concluded the industry is opting to trade lower fuel prices for lower fares. The airline also cited dilutive pricing in the Dallas/Forth Worth market spurred by the expiration of the Wright Amendment removing restrictions on certain long-haul flights from Dallas Love Field. 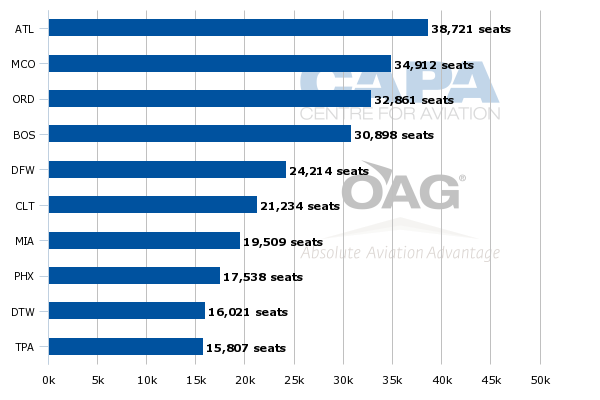 As a result Southwest, Virgin America and other airlines have added capacity in the overall Dallas market. Even as the industry-wide message appears to be that pricing discipline will not erode due to lower fuel prices, perhaps the large network airlines are using the opportunity selectively to match some of Spirit’s low fares in the lower risk environment created by cheaper fuel prices. For now the promises by Frontier’s executives of remaining in Trenton seem credible. Airline executives told the Inquirer that the airline has learned more about Trenton’s market dynamics, that include more flights to Florida in the winter and more non-Florida operations in the summer months. 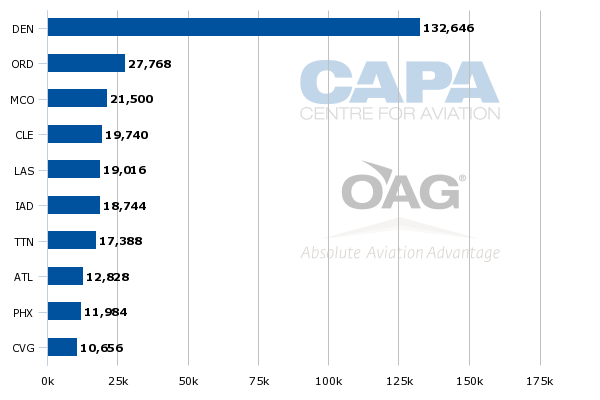 Data from CAPA and OAG show that Frontier’s seats on offer from Trenton are actually growing by nearly 19% from the week of 12-Jan-2015 to 18-Jan-2015 compared to the week of 22-Jun-2015 to 28-Jun-2015, and Trenton is rising from Frontier’s eight largest base to its sixth. It is not clear if Frontier’s overlapping markets from Trenton and Philadelphia will remain intact, or Frontier’s exact vision for Trenton over the long term, but the seasonal approach seems like a reasonable strategy for the time being. Frontier is the only commercial airline serving Trenton and New Castle airport near Wilmington, Delaware. The fate of its service at New Castle, which is 50km from Philadelphia, is more questionable. Frontier in late 2014 cut flights from New Castle to Detroit, Chicago Midway, Denver, Atlanta and Fort Myers. Frontier told Delawareonline that the cuts were seasonal. The airline has retained flights from New Castle to Orlando and Tampa, but it is unlikely that Frontier needs to serve three airports catering to the Philadelphia region. After cutting flights from New Castle, Frontier was chided in the consumer press for its previous marketing slogan of “Flying out of Philly is silly”. From a customer standpoint perhaps the rebuke was warranted as Frontier’s network movements during the last couple of years have been puzzling to the average consumer. With its ULCC strategy unfolding Frontier is taking the opportunity to target larger metro areas to stimulate traffic, a similar tactic to that used by Spirit, and by default those two airlines will also be increasing their competitive overlap, particularly in Cleveland during 2015. Frontier is also expanding its newly minted ULCC model at a time when larger airlines are initiating some pushback to the encroachment by ultra low-cost airlines. 2015 is shaping up to be a pivotal year for Frontier to prove that there are enough stimulation opportunities in the US for more than one airline flying the ultra low-cost banner - while at the same time keeping a close eye on the responses from their much bigger competitors.